Boulder Creek began life as simply Boulder, which was a reference to nearby Boulder Creek, which flows down the eastern side of Ben Lomond. Confused? Blame early settlers. Boulder Creek—the stream—is a descriptive name given by early trappers and lumbermen to a feeder creek of the San Lorenzo River. Directly across from its confluence with the river, Bear Creek flows into the river as well creating a strange topographical feature nicknamed the Turkey Foot by these same early settlers. The Turkey Foot unsurprisingly creates a bit of a flood plain, especially on the western side of the river where the mountainside is less steep. From the late 1850s, early settlers and lumbermen used this floodplain as a gathering point for their mule and oxen teams before their long journey to Felton and Santa Cruz. It is here were the story of Boulder Creek—the town—begins. Joseph Wilbur Peery, who later founded the short-lived town of Lorenzo a mile to the south, helped establish the settlement of Boulder when he erected a small sawmill across from Bear Creek in the early 1860s. 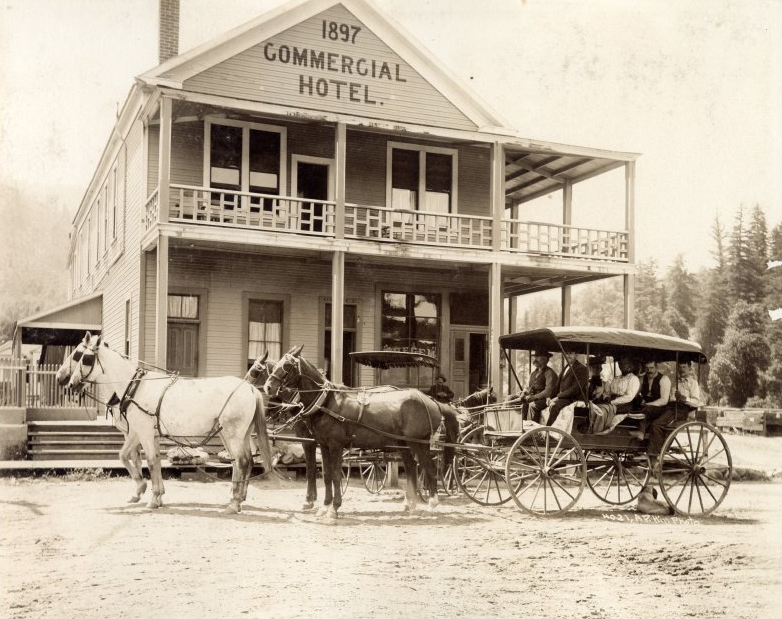 Lumbermen and their families moved into scattered cottages and homes around the periphery of the mill, while a general store, livery stable, blacksmith shop, and the Boulder Creek Hotel arose nearby to support the mill and its visitors. By 1872, a post office named Boulder Creek was established inside the general store and the Crediford family was quickly improving structures within the settlement. The area was still sparsely settled and only a few lumber mills were operating in the surrounding hills, but enough people were around to keep the town alive. Even after Peery relocated his mill further south to Lorenzo, the settlement continued with the help of the Credifords. The arrival in 1875 of the San Lorenzo Valley Flume & Lumber Company's v-flume began the process of turning Boulder into the much more substantial Boulder Creek. The flume passed directly to the east of town, cutting through the forested, marshy floodplain to the south of the Turkey Foot and then sending feeder flumes up Boulder and Bear creeks in search of additional water supplies. John H. Alcorn owned the floodplain, the hotel, a saloon, and a few other properties on either side of Boulder Creek, and sold all of them to the flume company in 1874 so that the flume could use the flat area for loading lumber onto the flume. For all intents and purposes, Boulder had become a company town. 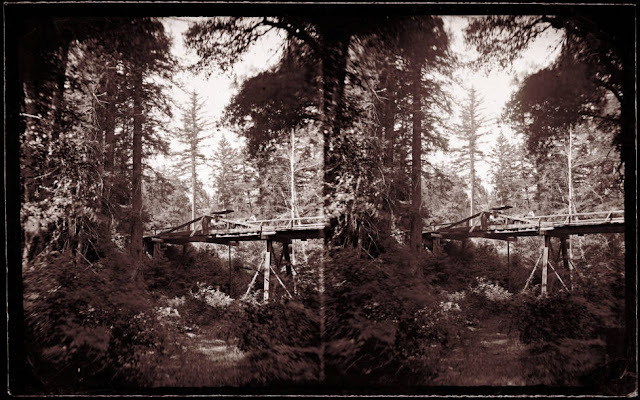 When the South Pacific Coast Railroad purchased the flume company in 1879, company's vice president, Thomas Carter, gained ownership of Alcorn's old lands in the marsh, although he spent little of his own money to develop the area. For the next ten years, lumbermen and their families, merchants, and other entrepreneurial minds began moving to Boulder, anticipating its future wealth and importance to the local economy. Peery in Lorenzo, the Credifords in Boulder, and Carter south of Boulder Creek subdivided their lands for private homes and businesses. 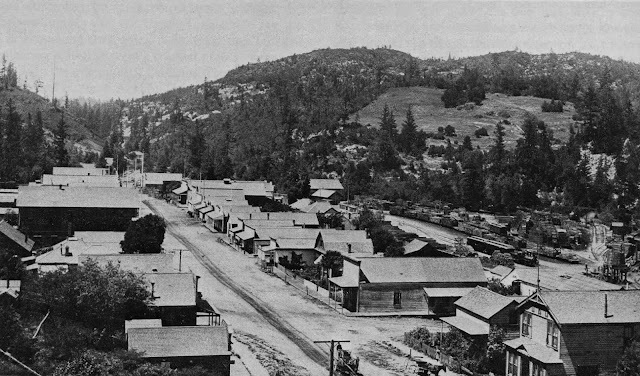 The flume land became the third distinct area of settlement, located midway between the older two, and it is to here where most of the new residents moved in the late 1870s and throughout the 1880s. The county road through the townships became Center Street in Lorenzo, Main Street in the flume lands, and San Lorenzo Road in Boulder and beyond. The Felton & Pescadero Railroad made certain that the flume property would become the unifying core of these three settlements. Surveyors bypassed Lorenzo on their way north, noting the lack of land for a staging area and resistance from the settled population. Meanwhile, the old settlement of Boulder had even less land and the presence of the river and two creeks meant increased costs of installation and maintenance. Inevitably, the railroad chose the flume company's marshland as its northern terminus. It made perfect sense: there was plenty of land here that could be flattened and raised to reduce the chance of flooding. It was also already owned by the railroad's parent company, the South Pacific Coast Railroad, which had purchased the flume in 1879. And the lands to the west were ideal for settlement, being already subdivided and the empty lots owned by the flume company. Thus, the area to the east of Main Street all the way to the banks of the river were earmarked for the railroad, and the Felton & Pescadero wasted no time in using that space to its utmost. 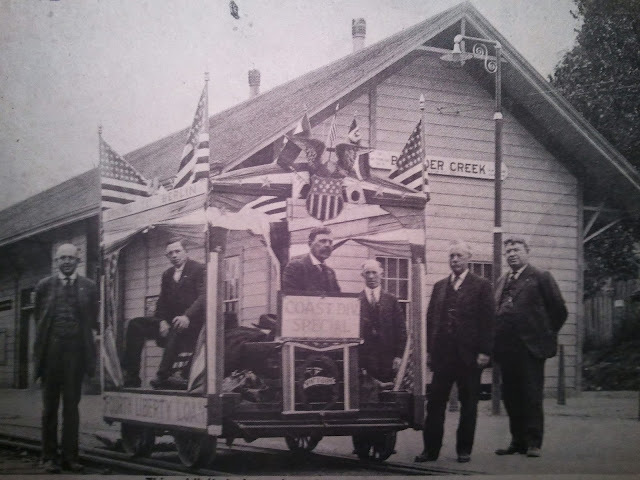 The first train rolled into town in April 1885 and the prosperity of Boulder Creek truly began. By 1887, the flume had been truncated to a terminus in the Boulder Creek rail yard and narrow-gauge railroad tracks had begun snaking in ever-expanding lines throughout the area. The first permanent depot was set up behind and below the Dougherty-Middleton general store, one block east of Main Street. The main railroad terminus was just beside the station on the east, while another spur ran to the west of the depot. A freight spur ran along either side of the flume, as well, with the easternmost splitting into at least three branches that all terminated beside lumber stacks. South of the depot and flume terminus, a tall water tower was erected beside a railroad turntable and two-locomotive engine house that could store the Boulder Creek switch engine overnight. Additional spurs and sidings arose over subsequent decades, especially once the flume was removed in 1888. 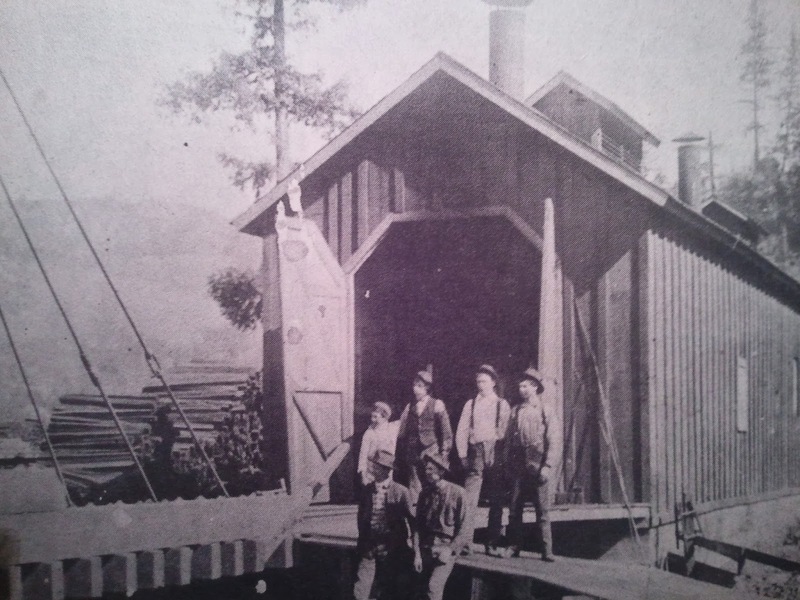 To replace it, the Santa Clara Valley Mill & Lumber Company extended a railroad line up the San Lorenzo River, leading to the installation of several more freight spurs and sidings on the easternmost side of the yard. Just above the banks of the San Lorenzo River, two planing and shingle mills were erected to cut and process wood brought to town by various lumber concerns in the vicinity. Meanwhile, two tracks reached across Main Street to a planing mill owned by the Southern Lumber Company. With the opening of the extension railroad, Boulder Creek boomed into life. Hundreds of lumbermen moved to the town, many living year-round, and a total of more than 800 people came to support the local industries in various capacities. A grammar and high school opened up on the hillside to the west of town, while churches, stores, more hotels, restaurants, and various other businesses setup shop along Main Street. In the hills, farmers, ranchers, and vintners moved onto tracts that had recently been logged. Wealthy Bay Area elite moved into other areas, protecting their lands from the axe through their desire for a peaceful seasonal retreat. Some of these people helped form the Sempervirens Fund, that, in 1902, helped create the second state park: California Redwood Park (now Big Basin Redwoods State Park). A special party car advertising Fourth Liberty Loans on the tracks beside the second Boulder Creek depot, c. 1915. Boulder Creek thrived as one of the largest exporters of lumber in the United States from 1885 to 1915 and the chief source of lumber within California for much of this time. And all of it shipped out via the railroad. 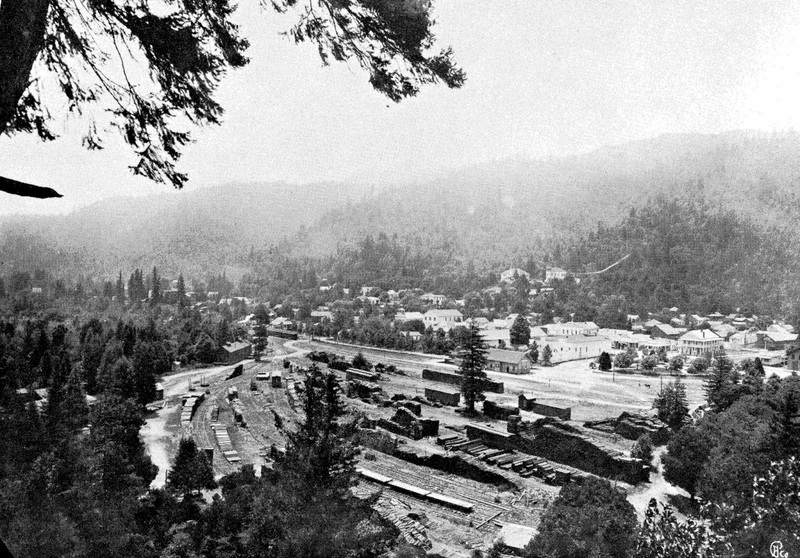 The 1906 earthquake did little damage to the Boulder Creek Branch and much of the lumber used to rebuild San Francisco and downtown Santa Cruz came from the upper San Lorenzo Valley. The earthquake also prompted Southern Pacific to finally standard-gauge the tracks to Boulder Creek, in effect turning the freight yard into a dual-gauge operation since the track north of town remained narrow-gauge. The depot itself was replaced with a much larger structure in 1910, implying that the future for the branch was still bright. Extensive logging for decades, however, led to an inevitable decline in available timber. The shingle and planing mills in the yard were the first to go in the early 1900s. The space left by the Smith mill was gifted to the city to become Junction Park. Meanwhile, mills across the upper San Lorenzo Valley began to close, leading to the abandonment of the extension railroad around 1917 and the end of regularly-scheduled evening freight service in 1921. The town transitioned begrudgingly from a lumber town to a tourist town. 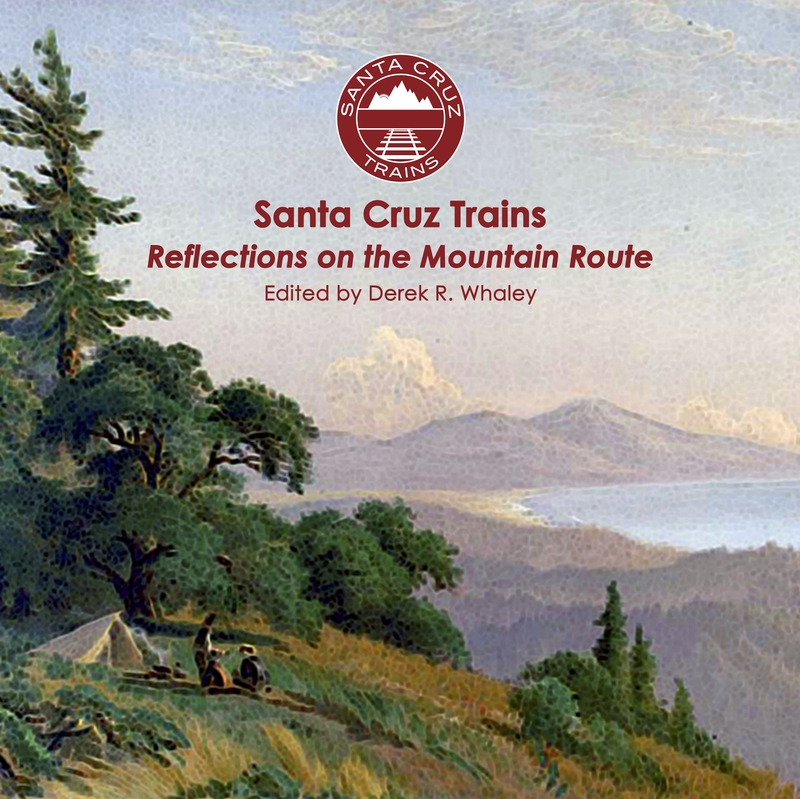 Capitalizing on interest in Big Basin, Castle Rock, local resorts, and other nearby sights, the town struggled on, even as the Great Depression descended painfully upon the San Lorenzo Valley in late 1929. In March 1931, Southern Pacific replaced the two regular passenger trains with Pacific Greyhound service. Three years later, even the occasional freight service was deemed superfluous. The few companies left could haul out cut timber via trucks, rendering the Boulder Creek Branch a needless expense. In January 1934, the last freight train left Boulder Creek with what rolling stock remained. 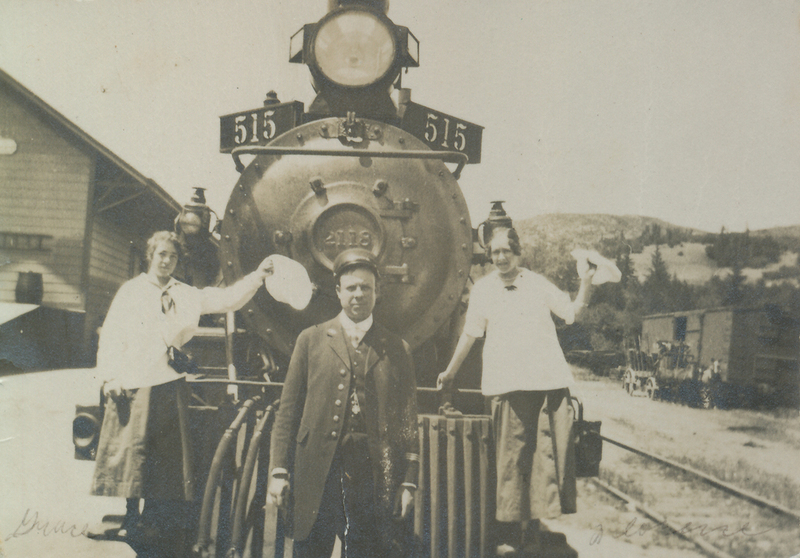 Grace and Florence Mosher and "Uncle Charlie" in front of a locomotive at the Boulder Creek yard, 1913. Over the next year, the track along the route was pulled, the freight yard was cleaned and subdivided, and the depot demolished due to lack of a buyer. Boulder Creek trudged on and continued to grow, despite the loss of its most significant industry, and today it is once again surrounded by redwood forests that have long since retaken the land that the lumbermen of the nineteenth century so wantonly cleared. The site of Boulder Creek Station is just behind the Boulder Creek Fire Department and beside the Boulder Creek Recreation & Parks District building near the corner of Railroad Avenue and Middleton Avenue. There is nothing at the location today except a playground and a parking lot. The adjacent road mostly follows the main track of the railroad right-of-way while the entire area from Railroad Avenue to the east once formed the Boulder Creek freight yard. Clues to the railroad's presence here can be found in the names: Railroad Avenue, Junction Avenue, and Middleton Avenue (named after one of the owners of the California Timber Company, the Dougherty Extension Railroad, and several businesses in town). The only evidence of the actual right-of-way is far to the south of town along East Lomond Street behind a private home. Trespassing is not advised. Hamman, Rick. California Central Coast Railways. Second edition. Scotts Valley, CA: Otter B Books, 2002. MacGregor, Bruce, and Richard Truesdale, South Pacific Coast: A Centennial. Boulder, CO: Pruett Publishing, 1982. Robinson, Lisa A. Images of America: The San Lorenzo Valley. Charleston, SC: Arcadia Publishing, 2012. 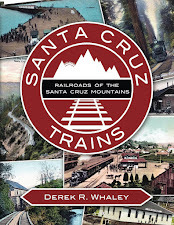 Whaley, Derek R. Santa Cruz Trains: Railroads the Santa Cruz Mountains. Santa Cruz, CA, 2015.
between Los Gatos and Saratoga can be found in the upper right corner. Thank You so much! I have lived here for 30 years and tracing the rail history of the region is one of my fascinations. I used to live on Middleton Ave. in BC and my children played in Junction Park for 30 years. I teach watershed ecology and local river and redwood forest ecology and have wandered these mountains for as long! Nothing is better than wandering along and finding fragments of a history not that long past...these ancient forests hold many tales! In 1874, the 160 acre Alcorn homestead, now owned by the Credifords, was sold to Carter, the VP of the Flume Company. I am pretty sure he personally owned it at that point. I am in the UK but have copies of the deeds at home. I send you copies when I get back. Also in the second paragraph I really don’t think that you can say that Perry inadvertantly established Boulder Creek. The town was laid out by the RR Co. and people were suprised when the depot was not put at the larger town of Lorenzo. Carter was critisized for not making improvements to the propery. The Forth Liberty Loans photo: I'm not sure that it was a party of any kind as it says "(something) to Berlin". It looks like a war drive. And that's an interesting scalloped design on the side of the station.